Welcome to Pennine Cottage email: sales@penninecottage.com A self Catering Farm Cottage in rural Rochdale A true Lancashire moorland cottage offering spectacular panoramic views. 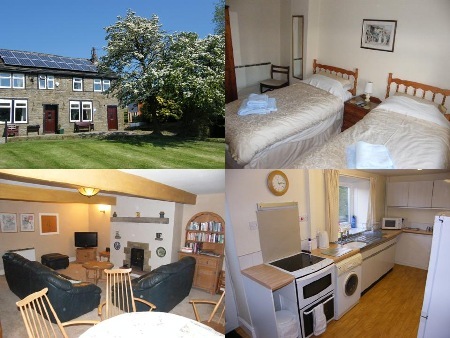 Pennine Cottage is set within an established sheep farm which has been in the same family for over 60years. The main activities are lambing (Spring) , hay making(Summer). Ideal for activity holidays such as hang-gliding, wind surfing, close to two golf courses, fishing, and riding or just walking on the miles of moor land. The local village of Wardle (5min walk) has a post office, butchers, newsagent, chip shop, public house and library. A good centre for visiting the Bronte Country, Yorkshire Dales, Holmfirth (Last of Summer Wine) , Hebden Bridge and Saddleworth villages. Sorry no smoking or pets. Free WI FI available. In the meantime you can reach us at 01706 379632 or 07970 687 640 or 07884494169. We are looking forward to hearing from you. You can also contact us at our e-mail address: sales@penninecottage.com or penninecottage@aol.com. In brief, our company was established in 1987 and provides a high standard of accomodation . Our specialty is in providing for a base for working or a base for visits to families in the area. We provide various baby and young child items at no extra cost. Our regular customers particularly value the peaceful yet readily accessable location. Our business is located at Bent Head Farm, Lower House Lane, Wardle, Rochdale, OL12 9PL.